Appearance (0-20): The initial inspection is very eye catching. The Puros sports a dark, oily wrapper. This vitola is a beautiful box press, that is similar to the La Herencia Cubana Core. The band is somewhat simple, that boasts some bright writing over a dark black band. Overall, it’s pretty inviting. Construction (0-20): Before lighting this bad boy up, there was one interesting fact I noticed; the cigar is quite springy or spongy. It is well packed, but not as hard like some other well packed cigars. This made me think that it might burn fast, but there were no issues at all. After clipping off the cap, which left absolutely zero debris, I took a few draws. The draw was easy, smooth, and produced a significant amount of smoke. The ash held on for about 1.5 inches. The only flaw was a somewhat uneven burn on two occasions, but it correctly itself without requiring any touch ups. 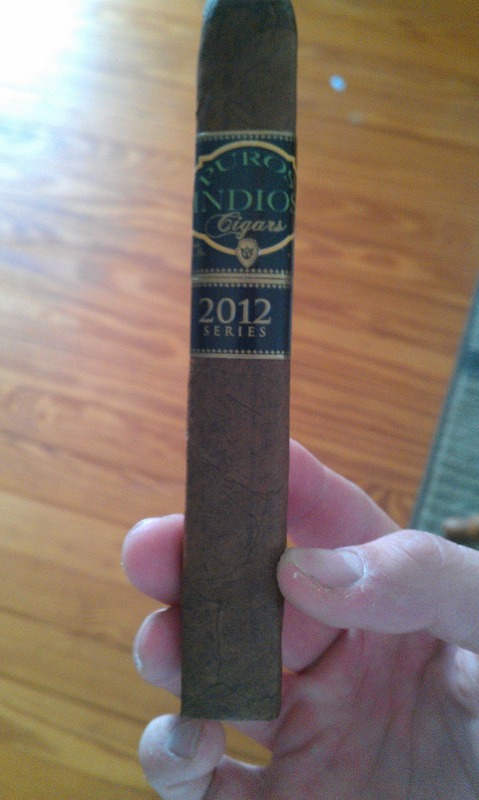 Strength (0-20): Boasting a medium-full bodied smoke, the 2012 series was exactly that. 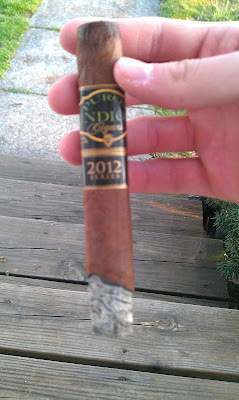 The mainy attraction to this stick was definitely the flavors, yet the strength profile was spot on. Overall, a stick to really sit back and enjoy. If anything, it could have used a bit more heft. Flavor (0-20): Each and every puff was super flavorful. From start to finish you will encounter a smoothy and creamy draw each time. The overpowering profile belongs to sweetness. Toasted nuts, leather, and cocoa will leave you satisfied. Even the retrohale will give off sweetness, and here is where you can find small bits of spice. After about halfway through, you will find the sweetness hanging around on your tongue. Value (0-20): This is where I am a bit torn. The single stick price comes in at $8.00. Once you get into the realm of around $10, there are so many premium cigars to choose from. While the price tag isn’t bad, you might question picking it up the first time. I actually grabbed these on cigarbid for $3 each, which was quite a steal. If I had any suggestion, I would grab a box or 5-pack, which would reduce the price per stick significantly. Read the offer below under Additional Notes. Additional Notes: Smoked on my porch, paired with water. There are only 3 master rollers selected to prepare this cigars, and they are limited to a total of 100 cigars each per day. Overall (0-100): From having no experience with this, I was quite happy with my purchase. If you’re looking for something different to try, you could reach for this stick. It is totally different that the previous Puros Indios (bright green band), and a much fuller smoke. As stated above, the best part is the sweetness of the tobacco. Luckily I picked up 5 of these, so I will be saving a few to see how they age. Happy herfing!